Here are some online links to videos and audio produced by Enda Murray and Virus Media. Some links contain whole programs, some contain segments. Production and mentoring project with young people from the wider African community in Western Sydney. Features the Africultures Festival of African Culture. Interview with Irish director Paddy Breathnach about his new feature film ‘Viva’ which screened at the Sydney Film Festival 2016 (for the entertainment website ‘Pop Planet’). Video clip for Irish songstress Áine Tyrrell shot on location at the Port Fairy Folk Festival 2016 in Victoria. 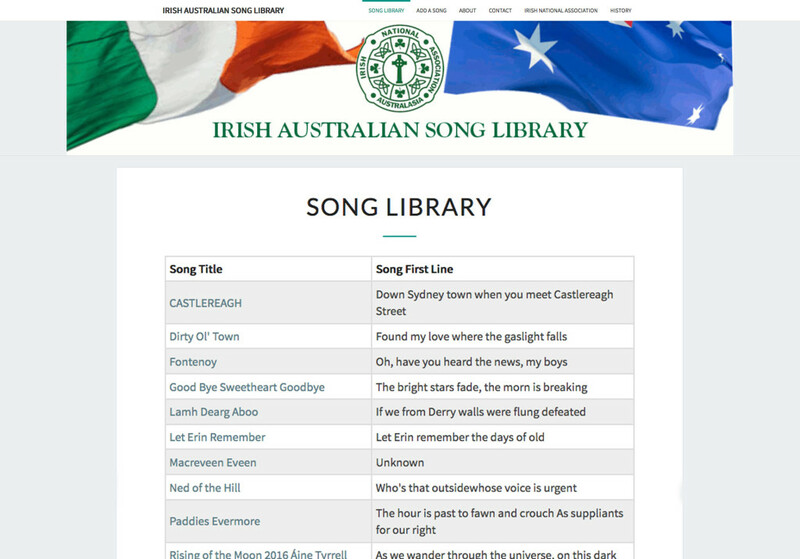 Áine Tyrrell’s version of ‘The Rising of the Moon’ was made to launch the new ‘Irish Australian Online Song Library’ website. The video was recorded in 2016 at Hyde Park Barracks in Sydney and features Áine Tyrrell and Nick Martin on uileann pipes. Behind the scenes on the Ireland float at the Sydney Gay & Lesbian Mardi Gras. This website is an online library for Irish Australian songs. The website can accept user generated material and features lyrics, music sheet, first line finder and links to video renditions of the song. The project was supported by the Consul General of Ireland and the Irish National Association. Engaged Research project with the Institute of Culture and Society at the University of Western Sydney. Audience-participants shared their thoughts and reflections on the future of Parramatta via digital storytelling. Recent refugees to Australia share their experiences in participatory film workshops. They wrote, filmed and edited this short film. A series of films made in workshops with young indigenous and refugee children as part of Migration and mobility: the question of childhood in Chinese and European cinema. This project is an ARC Future Fellowship research project led by Professor Stephanie Hemelryk Donald, Future Fellow and Professor of Comparative Film and Cultural Studies, University of New South Wales. There are two series of films – one produced by young Indigenous students in St. Vincent’s College, King’s Cross in Sydney and the other by students who are recent arrivals to Australia who attend Fairfield High School in Fairfield. I grew up in Ireland but left there in 1985 and finally settled in Sydney. I made this film because I wanted to explore what connects me to family, community and place in Ireland. What aspects of my Irishness would I pass on to my daughters in Australia? What parts would they want? In Secret Family Recipes the ritual baking of a family cake unlocks hidden stories of family, community and place. Workshop based music project in Punmu Community, Western Desert, West Australia with Monkey Marc, Shannon Kennedy (Ozi Batla). 5 minutes. 5 minute promo for documentary about growing up with cancer (in production). Radio Doco. A peek into the life of a young Ethiopian exile as he plies his musical trade in the Sydney suburbs. 17 minutes. Sydney musician Peter Strong as he joins forces with Earthdream, a group of international artists travelling across Australia to highlight issues of Aboriginal land rights, uranium and sustainable energy. 24 mins. Radio doco. Mad Max meets the Merry Pranksters in the red centre of Australia – It’s a road movie on the radio! 34 mins. Multi-award winning short drama made with young Aborgines in Redfern, Sydney. A selection of scenes from 26 minute drama. Bexley Reclaim the Streets.This was an early 1999 protest about the construction of the M5. The man with the impressive quiff is the very talented Joel Salom. A witty and engaging documentary about a ladies Irish Rules (Gaelic) football team in Sydney which sheds light on four separate stories of female emigration. Documents a huge party organized by Dogs of Heaven in Manchester to celebrate the razing of these squatted flats in Hulme. Sound system by DiY. Djs Digs & Whoosh. Very early Sydney bicycle activism circa 1995? The cop was hilarious – can’t see a cop being so polite now. Very happily, about 15 years later, South Sydney Council made this route one of the first bike lanes in Sydney so the action was very prophetic. This program was included on the news magazine, News Unlimited which published three issues from 1996 to 1998. Mongrel music video cut-up and bastardised briccolage of the Civil Liberties campaign in the UK in the time of Thatcher. Sound System explores the little known subculture of the British reggae sound system scene. The program follows veteran Birmingham dancehall crew Quaker City as they play out in Handsworth and features interviews with some of the major players in the British dancehall scene. 15 minutes. This one’s more of a pop video clip but I played out as a vj with these guys (DiY from Nottingham) at several momentous free parties (including Castlemorton 1992) so I have a soft spot for them. The track was called Hothead (1993) and was released on Warp. The video was shot at a free party somewhere near Brighton. Video coverage of first anti-Criminal Justice Bill march/party from Hyde Park to Trafalgar Square. The Bill was introduced to outlaw raves in the months following the Castlemorton free party in May 1992. Video Clip for Coventry rave band featuring Chris McGuigan, Nathan Joseph and Chris Dalton. 4 minutes. Filmskool film from St. Martin’s School of Art, shot on 16mm film. Features cool production design and great title sequence front and back which is almost as long as the film itself. Made by a nice bunch of people. Dedicated to Paul Bettell who was a gentleman. Short drama shot in squat in Rotherhithe, South London. Stars Nicky Mallon as a depressed Irish immigrant whose days are bookended by popular tv shows.